Our large, spacious circulation area, containing our POD Theatre, is the centre-piece of our facilities. Surrounded by glass and steel with an abundance of natural daylight and an attractive over-head mezzanine floor level, the space is perfect for breakout sessions, exhibitions, fashion shows, product launches, weddings, parties, private dining and receptions. 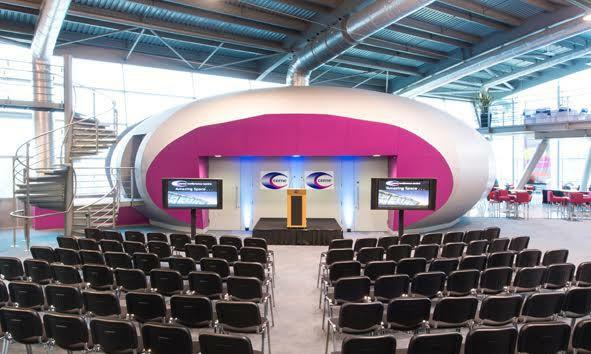 CEME Conference Centre is an ultra-modern events and meetings venue offering innovative and flexible solutions for all your meetings requirements from our high-tech conference auditorium - the POD Theatre to small meeting rooms, conference, exhibition and outdoor space. We deliver hundreds of meetings and events each year with ‘state of the art’ meeting space from as little as £99.00 per day and can host product launches, presentations, award ceremonies, training seminars, conferences and exhibitions and cater for up to 600 delegates. CEME is also an ideal wedding venue with landscaped gardens, lakeside decking areas and amazing reception areas. CEME is also a ‘Centre for Excellence’ reflected in the quality of the events and conference facilities through our ‘Accredited in Meetings’ Gold quality standard with the MIA – the only Gold venue in East London or Essex; membership of Conference Centres of Excellence; and a World Host venue for outstanding customer service. CEME are also signed up for the Fair Pricing Charter making CEME one of the most affordable events and meetings venues anywhere in London or Essex and offering ‘City quality without City prices’.